Free shipping. Buy direct from HP. 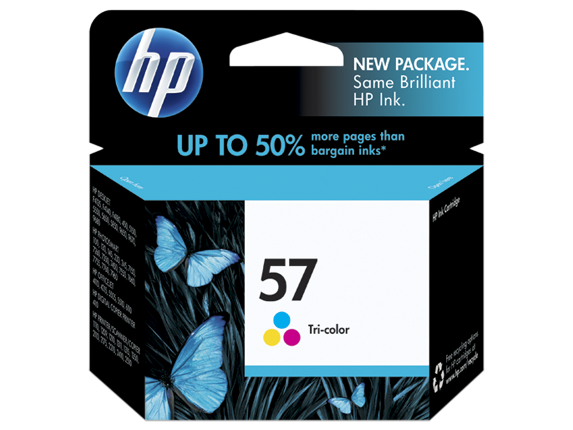 See customer reviews and comparisons for the HP 57 Tri-color Original Ink Cartridge. Upgrades and savings on select products. Count on outstanding color for a variety of printing needs. Patented HP inks work with your printer for true-to-life photos and impressive color accuracy. Easy and intuitive print cartridge replacementHP inks engineered to ensure compatibility with all printing system componentsDesigned together to work togetherCartridges work with the printer to achieve true-to-life and consistent colors. 1 Exceptional fade resistance achieved with HP 58 and HP 57 Ink Cartridges and HP Premium Plus Photo Paper together. Color photos resist fading longer than most traditionally processed photos. Based on Wilhelm Imaging Research, Inc. light fade testing under glass. For more information, see http://www.hp.com/go/premiumplusphoto 2 Continuous tones achieved by HP 58 and HP 57 Ink Cartridges together; HP 58, HP 57 and HP 59 Ink Cartridges together. 3 True-to-life photos in 8-ink printing achieved with HP 59, HP 58, HP 57 Ink Cartridges and HP Premium Plus Photo Paper. 4 Display-permanence rating by Wilhelm Imaging Research, Inc., or HP Image Permanence Lab using select Original HP inks. For details visit http://www.hp.com/go/printpermanence.